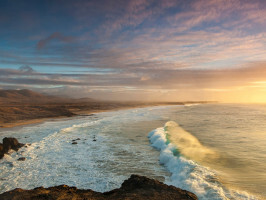 There is no better way to know the north of the Fuerteventura Island with our 4x4 vehicles, because they allow us to switch the narrow asphalt roads with gravel roads. 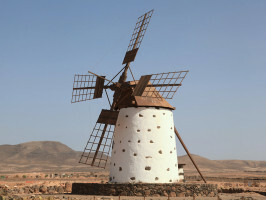 That way, we will reach places as beautiful and spectacular as the Calderón Hondo Volcano, the typical village of La Oliva located in the north of the island of Fuerteventura. There is no better way to know the north of the Fuerteventura Island with our 4x4 vehicles, because they allow us to switch the narrow asphalt roads with gravel roads. 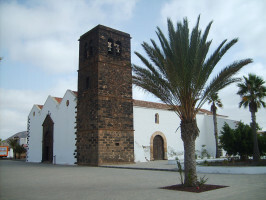 That way, we will reach places as beautiful and spectacular as the Calderón Hondo Volcano, the typical village of La Oliva located in the north of the island of Fuerteventura. We will visit the sacred mountain of Tindaya, one of the main deposits of rock manifestations of the island, was considered magical by the Guanches. 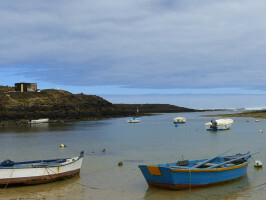 Later we will go towards the coast to contemplate the white sandy beaches of Majanicho and especially the natural lakes of Cotillo village, from the seventeenth century we have been informed of the existence of a fishing settlement around the zone of disembarkation then known by Puerto del Roque. 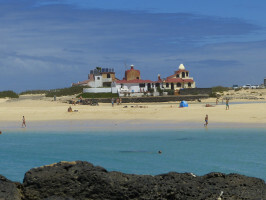 Where we will have free time to swim and activities if you fancy, Cotillo is one of the most beautiful beaches in Europe. Excursion where animation and the information will be combined. It will be an unforgettable day. Lunch in route. 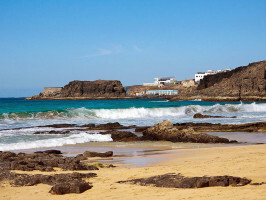 Meeting/pick-up point: Pick-up at the hotels in Playa Blanca, Puerto Calero, Puerto del Carmen, Arrecife and Costa Teguise. Duration: Approximately 8/9 hours (excluding transfer time). Start or opening time: At 7am. Departure from Lanzarote by ferry at 8:30am. End or closing time: Approximately at 6:30pm. Return to Lanzarote by ferry at 7:30pm. Languages: French, German, English, Italian, Dutch and Spanish. Recommend: Sport shoes, swimsuit, photo camera, beach towel. Others: Remember to bring the voucher and valid photo ID with you. The Company reserves the rerouting for possible causes of force majeure. For security reasons, they are not permitted alcoholics beverages. Child seats are available and can be paid directly. Recommended : sports shoes, warm clothes, photo camera in winter, wear warm clothes. Extra comments : The Company reserves the rerouting for possible causes of force majeure. For security reasons, they are not permitted alcoholics beverages. Child seat direct payment.